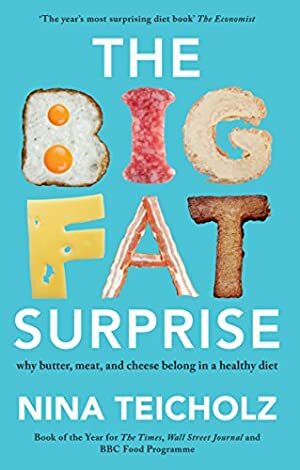 In The Big Fat Surprise, investigative journalist Nina Teicholz reveals the unthinkable: everything we thought we knew about dietary fat is wrong. For the past 60 years, we have been told that the best possible diet involves cutting back on fat, especially saturated fat. But what if the low-fat diet is itself the problem? What if the very foods we've been denying ourselves -- the creamy cheeses, the sizzling steaks -- are the key to reversing the epidemics of obesity, diabetes, and heart disease? In this captivating, vibrant, and convincing narrative, based on a nine-year-long investigation, Teicholz shows how the misinformation about saturated fats took hold in the scientific community and the public imagination, and how recent findings have overturned these beliefs. She explains why the Mediterranean diet is not the healthiest, and how we might be replacing trans fats with something even worse. With eye-opening scientific rigour, The Big Fat Surprise makes the ground-breaking claim that more, not less, dietary fat -- including saturated fat -- is what leads to better health and wellness. Science shows that we have been needlessly avoiding meat, cheese, whole milk, and eggs for decades, and that we can now, guilt-free, welcome these delicious foods back into our lives. Track It. This book has been £6.23 within the past year. Log In to track Nina Teicholz on eReaderIQ. to be notified each time the price drops on any book by Nina Teicholz. to stop tracking Nina Teicholz. We started tracking this book on September 22, 2014. The price of this book has changed 222 times in the past 1,676 days. The current price of this book is £7.56 last checked 5 hours ago. This lowest price this book has been offered at in the past 90 days is £7.40. This lowest price this book has been offered at in the past year is £6.23. The lowest price to date was £1.29 last reached on October 18, 2014. This book has been £1.29 one time since we started tracking it. The highest price to date was £9.40 last reached on December 20, 2018. This book has been £9.40 one time since we started tracking it. We last verified the price of this book about 5 hours ago. At that time, the price was £7.56. This price is subject to change. The price displayed on the Amazon.co.uk website at the time of purchase is the price you will pay for this book. Please confirm the price before making any purchases.